Subscribe to our mailing list and we will send you irregularly some news about what we do. We will not spam you, we will not share your details with others. September 15, 2017: LimeSurvey is about to release version 3.0 in the fall of 2017. This new version will be the version we will develop a new template for and NOT for 2.5x or 2.6x. When you subscribe to our newsletter, we will inform you when the new version of our template for LimeSurvey 3.0 and up is ready. Why would you want a new responsive template for LimeSurvey? 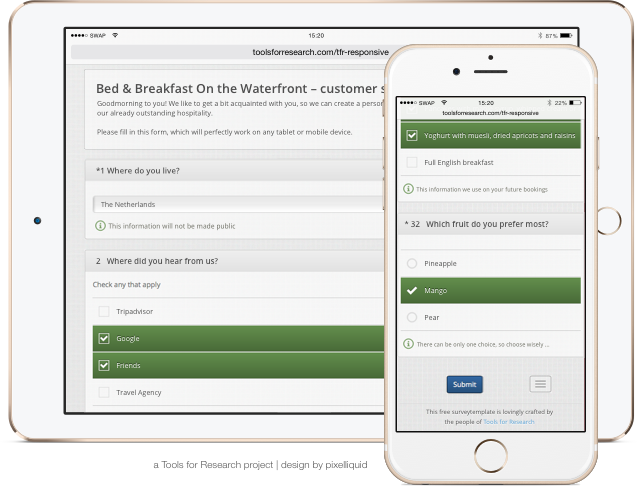 We are convinced that an easy to fill in, quietly looking template makes online surveys easier to fill in and will lead to a reduction in non response. We found that all currently available templates do not meet our wishes, so we developed one ourselves. Since LimeSurvey is Open Source, we gladly share the free version with everyone that wants to use it. If you do not know what LimeSurvey is and are interested to know more, please visit our short explainer on Limesurvey. We have tested the template and the questions we normally use work on version 2.06 (and 2.05) of Limesurvey. We have not tested it on earlier versions, so it may probably not work on older versions (2.00 and before). The template will work fine on all modern major browsers. IE8 is not modern, so it will probably fail in that browser. The current release (1.7.3) will not work with LimeSurvey 2.5x or 2.6x. We are working on a new release. Since we hope to distribute improved versions periodically, we hope that you send us your improvements, so we can incorporate them in newer versions. We cannot guarantee that we will incorporate all suggestions, but we will certainly look at them. Please subscribe to our newsletter and/or visit our website for news on the template. Free, Premium, Custom: what is the difference? To show you what we have made thusfar and how it looks, we also made a demonstration survey. This demo in LimeSurvey 2.06 uses the Premium template. Inspired by Bootstrap and the work done in BootstrapForLimeSurvey. Counting downloads of the free template from this site since May 9, 2015.